I attended this convention in 2015 and 2016 and my overall experience was phenomenal. In both years, this convention was my highest performing event in terms of both gross and net profit. The crowd was enthusiastic and engaged with my anime and video game fanart, the foot traffic was consistently busy on both Saturday and Sunday, and sales were tremendously strong. 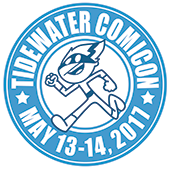 Tidewater Comicon suffered a number of missteps in 2017 that took it from being a fantastic hidden gem in the artist alley community to a complete waste of a weekend. There were two main issues in 2017: one, the convention coincided with Mother's Day weekend, and two, the number of artist alley and vendors doubled in size. First, let's talk about the dates of the convention. The staff should have known better than to schedule the convention for Mother's Day weekend. Most of the attendees consist of families and younger attendees, so it seemed obvious from the outset that Sunday would be a ghost town due to Mother's Day activities. My understanding is that this was the only weekend available in May at the Virginia Beach Convention Center, and apparently in 2018 as well. (The 2018 dates have already been announced and it's Mother's Day weekend again.) Why does it need to be in May? I'd happily attend in June, July, or August if it meant a healthy attendance number. Second, the size of the artist alley and vendor space was a mess. The number of vendors and artists doubled in 2017, and this severely impacted the economy of the convention. There were simply too many vendors and too small a crowd to ensure that there were enough sales to go around. Additionally, the new layout made it nearly impossible to get to the artist alley tables without first going through the pro vendor section. As a result, most attendees complained that they had spent all their money with the pro vendors by the time they reached the artist alley section. In the past, the layout was a healthy mix between big time vendors and clusters of artist alley tables. This allowed the foot traffic to shop with artists and pro vendors simultaneously. Sales were truly pathetic and you could literally see the disappointment and self-doubt on the faces of the other artists. I netted over $1,000 in 2016, and in 2017 I didn't even break even. Overall, I'm so saddened by the future of this convention. 2017 was awful and 2018 is already shaping up to be more of the same. I will not be returning unless the management decides to pick a more prosperous weekend and scale back the number of vendors to suit the projected attendance. It would be fair to say that this show was a disappointment. We went into this year with a fair amount of optimism considering we were pleased having sold at the con the previous year. Unfortunately, this year's experience was a disappointment. The Good: Our staff interaction was largely positive and check-in went fairly smoothly. The cost of the table was not terrible and we were able to find affordable hotel rooms a bit further out. The Bad: This year the convention significantly increased the number of tables in the vendor and artist alley. This caused the pool of available money to be spread very thin which resulted in significantly reduced revenues for ourselves and everyone else we knew that attended this show. In addition to the above disappointment, attendance did not seem to grow and possibly may have been reduced this year, although this is based on a gut feeling and cannot be verified with any hard data. The whole weekend felt muted and not very energetic. As a particular point of frustration, the amount of bootleg goods was high along with the presence of at least two tables of art thieves. At this point, its not a show that we are eager to return to, but we will monitor it and see if changes are made. Definitely not a show to travel a great distance to. This wasn't one of the worst cons I've been to, but still pretty bad. The table itself was $150 and 6ft, which is pretty normal. This was a 2-day con taking place on Saturday & Sunday. Maybe it was because it took place on Mother's Day or because of the way Artist Alley was set-up, whatever the factor was, sales hurt and there was literally no traffic on Sunday. Saturday saw most of the traffic, but even then sales suffered. And as for said set-up, the alley was a wonky layout. Fellow artists complained about props (such as the bat-mobile) blocking their aisle and making it congested. Then the layout itself was spread SO strangely. I even walked around twice, only to have another artist show me to their booth and I didn't even know that side EXISTED, The "game room" (if you can even call it that) was also in the same hall as AA & Dealers. Very strange. Extremely wonky layout that just confused me. The staff I talked to were pretty nice and accommodating. Check-in was a breeze and whenever I had questions they always helped. When I reported someone's display that was in front of their table and blocked my display and made the aisle congested, the staffer took care of that immediately. I asked him to to name any names because I didnt want conflict and he assured me he wouldnt say anything. All the staffers were good except for 1 chaotic staff member that talked with the artist I reported and then went on a witch hunt to find out WHO reported them. Yeah. Okay, really professional. Anyway, wouldn't recommend this con if you're not a local as it isn't worth the cost of hotel + airfare. Maybe if it was a 3-day con it wouldn't be so bad for profit, but in this case, holding it on Mother's Day weekend + wonky layout = bad for business. I definitely will not be attending next year.